There are 3 chapters dedicated to nutrition in my book In Your Elements. Get your copy on Amazon! 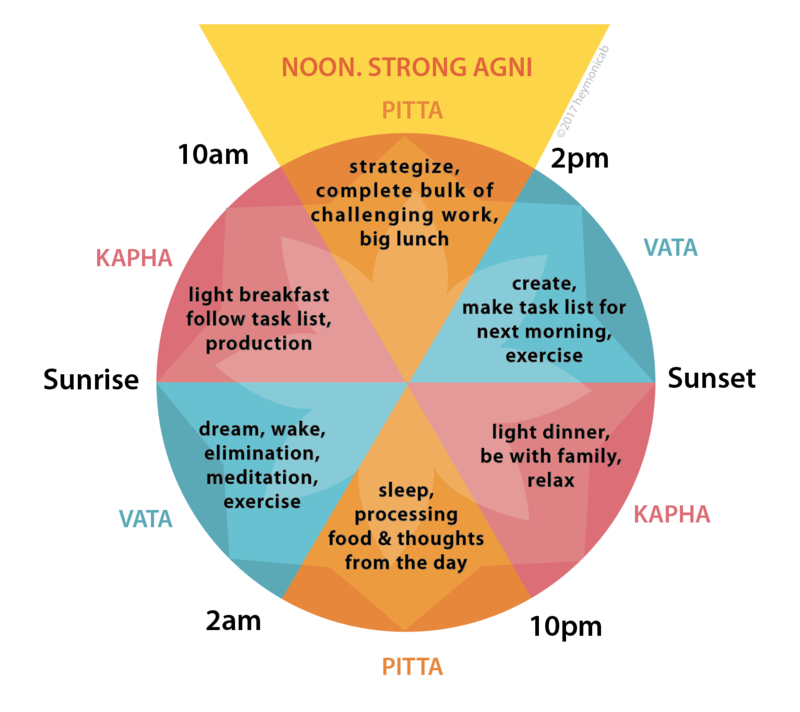 If you are unfamiliar, Ayurveda sees nutrition in a very different, refreshing way! The basic Ayurvedic nutrition guidelines below have a lot to do with how we eat, not just what we eat. Food should be full of rainbow colors, varied tastes, made from high quality foods, and most of all it is to be enjoyed! 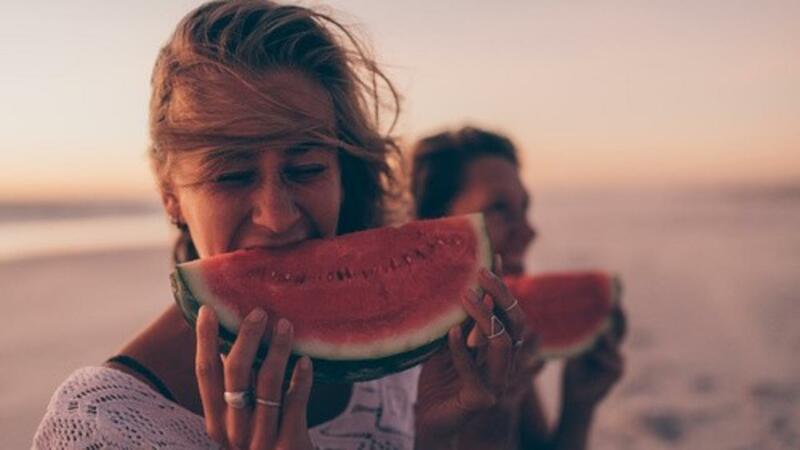 So while there are foods that are "better" for you based on your dosha, don't let that confuse or frustrate you, especially if you are new to this perspective on nutrition. The body's internal digestive fire is called our agni. When agni funtions properly, whatever we have eaten gets digested and absorbed by the body's tissues. Then the body eliminates waste. Pretty simple. However, when doshas or tissues are imbalanced due to lifestyle, diet, negative emotions, etc., agni becomes weakened or disturbed and therefore cannot digest food properly. In Ayurveda, "You are what you digest." If you can't digest it, you'll get imbalanced! 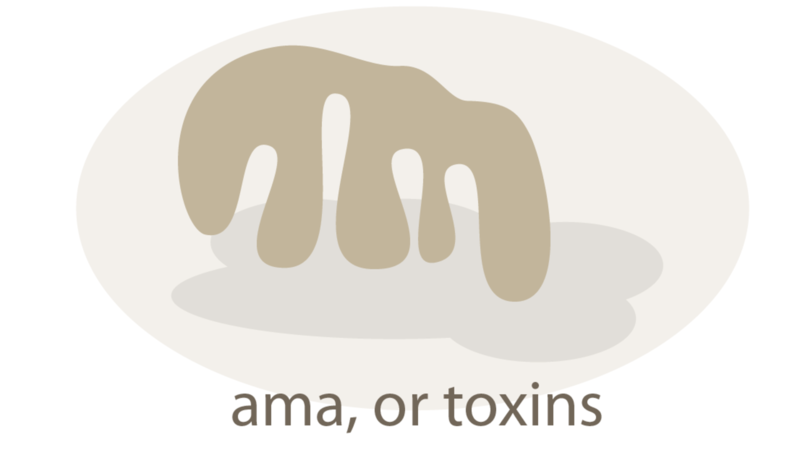 This undigested food (and emotions) turns into ama, which is a toxic, sticky, cloudy, smelly substance that can spread from the digestive tract to other parts of the body. From there it can lodge itself into crevices (sometimes large crevices) causing clogs in channels, blood vessels and cell membranes. Yeah, eu. It's gross. It sounds complicated and difficult to get ama, but it's kind of easy if you're not paying attention. Learn more on optimizing your digestive fire, what food is best for your dosha and so much more in my book In Your Elements on Amazon. 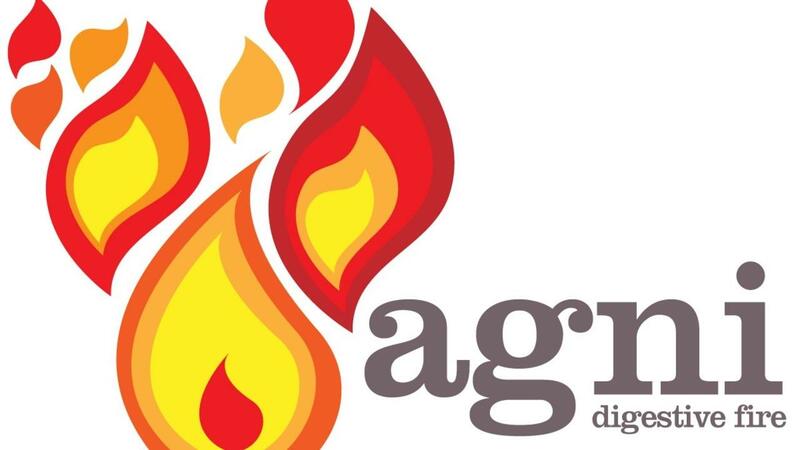 Agni, our digestive fire, is responsible for processing and absorbing the foods we eat. The function of agni is the main contributor to our physical and mental health and when agni functions properly, we thrive. But when agni malfunctions, we get sick and we can accumulate ama (toxins). MOST (like 90%) disease and imbalance is caused by malfunctioning agni. 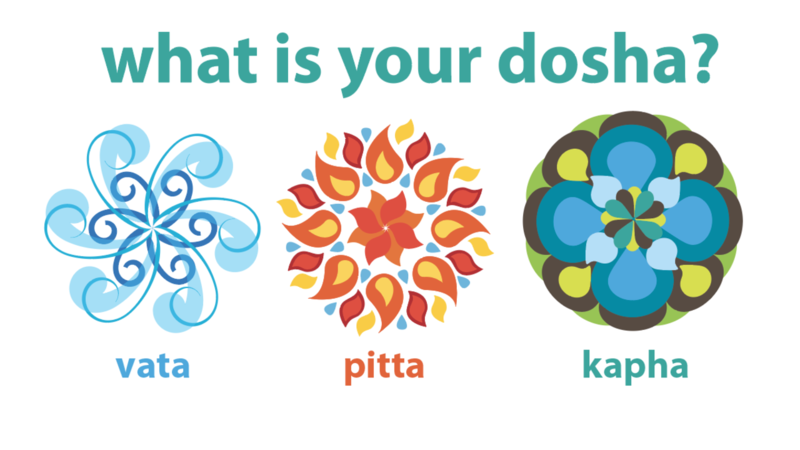 What is Your Dosha? Take This Simple Test. 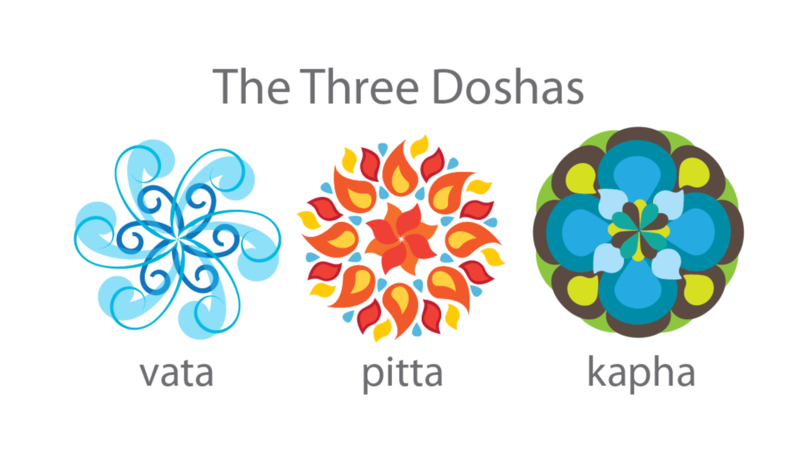 The doshas are 3 energies that are made from 5 great elements: space, air, fire, water, earth. We have all three of the doshas in us, but one or two will be most dominant. When we understand which dosha governs our body-minds the most, we can craft our diet & lifestyle to suit our individual needs. When our doshas are balanced for who we are as unique individuals, we will enjoy optimal health! For more on what doshas are, I briefly explain them in this video. Take the test below to determine your balance of dosha(s). Questions should be answered based on authentic, pure you and not what happens to be true recently. Afterall, life habits can imbalance us over time. If it's very hard to choose between two answers, pick both, but for the most part try to pick only one that feels most true to you.